By Caz | April 19, 2019 | This post may contain affiliate links, which means we may receive a small commission, at no cost to you, if you make a purchase through a link. Read our Disclosure. Looking for travel tips on what to do in Rotterdam? As part of our city guides series, we interviewed Tom Summerfield who is an Aussie but has been living in Rotterdam since October 2011. Tom shares with us his insider tips on what to do in Rotterdam for those looking for the best places to see, eat, stay, drink, and explore. Rotterdam actually has a lot to offer visitors, but on first glance it’s not as ‘beautiful’ as its arch rival Amsterdam. There is a reason for that, the place got completely bombed in World War II and instead of rebuilding it in traditional Dutch style, it became a place booming with modern architecture and funky buildings. You’ll enjoy Rotterdam a LOT more if you know where to go out and some interesting things to do off the bat. Amsterdam can be great to simply wander and breathe in the sights without any real purpose, whereas in Rotterdam you’ll need a few tips on where to go. Rotterdam plays host to Europe’s largest port, so of course there are a number of boat tours you can do if checking out the port sounds like fun. If you’re into architecture there are myriads of buildings to investigate, from the Cube Houses near Station Blaak to the quirky buildings located near Central Station. The Euromast “Space Tower” is also a big attraction, there is a restaurant on top and it’s worth seeing just for the view. You can even go abseiling off the side but this is not something that’s available all the year round. 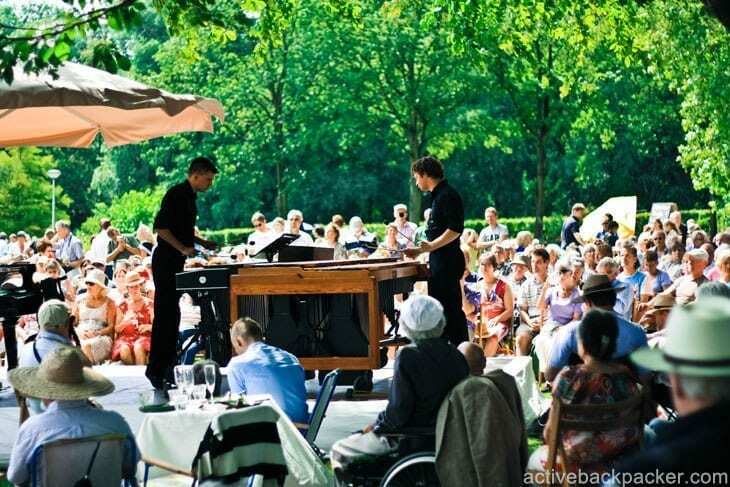 My hot tip is to have a picnic in the Euromast Park nearby, on a sunny day it’s a beautiful park full of shady trees, vibrant green grass and lazy Dutch streams. For museum lovers there is the Boijmans museum. It’s actually considered to be one of the best museums in Western Europe, and it’s located in “Museumplein” which, as you can imagine, has lots of museums nearby such as the Natural History Museum and the Kunsthall. The suburb of Kralingen is worth a visit, it still retains many of the traditional old Dutch buildings and is a merry mix of students and the wealthy. Close by is the Kralingse Plas, a huge lake where people go ice skating in winter and relax on its banks and parks in summer. Food in Holland is exceptionally multicultural, and considering their history as traders (and ahem, slavers) this is completely understandable. Most Dutch people find the traditional Dutch fare a bit boring and generally opt for Italian or Asian cuisines when dining out. For the best Korean I’ve ever had pop into the unassuming restaurant known as Gamasot on Pannekoekstraat. Good budget takeaway Indonesian can be found at Papaya on Groenendaal, the Rotterdam markets also offer numerous delectable food treats. Try a Turkse Pizza, or some more traditional fish snacks like Kibbeling or Herring (if they’re in season you MUST try one). Cafe Van Zanten on De Meent or Villa Kakelbont in the Oude Haven are good spots for a drink in the sun or in cosy (gezellig) cafes. The Belgium Beer Cafe Baldwin is also a lovely spot to sample the smorgasbord of tasty beers on offer. For some cracking live music and nightlife check out Rotown on Nieuwe Binnenweg. Paddy Murphy’s Irish pub is also fun for expats and locals alike – but you need to like Irish pubs (it has a sports bar too if you want to see the game). The three main streets for nightlife, in my opinion, are Witte de Withstraat, Nieuwe Binnenweg and De Meent. There are lots of great cafes and pubs around these areas, try the Zwarte Schaap or the Witte de Aap on Witte de Withstraat for two funky and lively cafes. There is actually a hostel right in the Cube Houses called Stayokay hostel. That looks like fun, and is one of the only hostel options for Rotterdam (it’s located in a great spot as well). 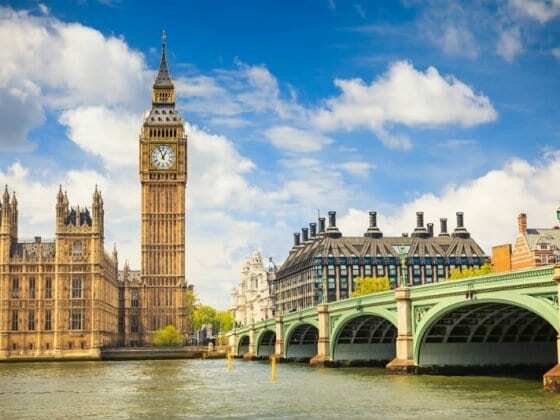 The Savoy hotel is a good mid-range option to investigate, and those wanting to splash out on something nice should check out Hotel New York. For a local and unique stay consider booking with Airbnb. 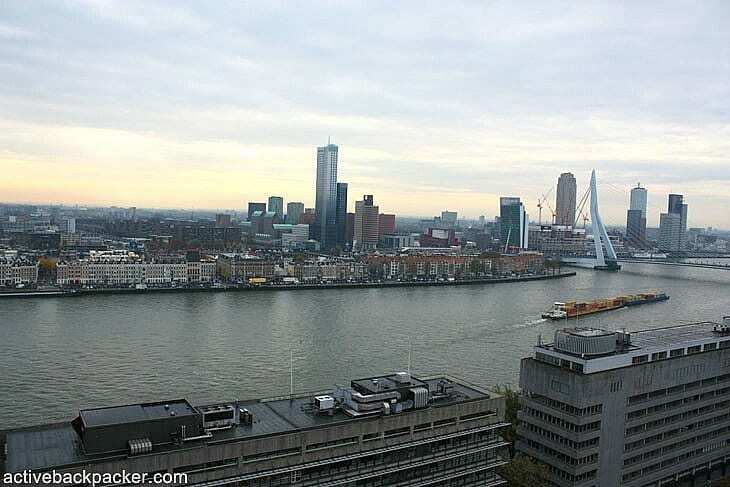 Click here to view the properties available during your stay in Rotterdam. For more places to stay in Rotterdam choose from the largest range of hotels, apartments, and guesthouses with our partner Booking.com. You get free cancellation on most rooms, and in most cases you only pay when you stay. The Rotterdam Market in the city (behind the Church and near Blaak station) is AWESOME. We actually live nearby and it’s an excellent market to grab fruit and vegetables, flowers, antiques and loads more. Try a fresh turkse pizza, kibbeling (deep fried fish pieces with delectable sauce) or even herring with onions on a bread roll (haring broodje) if they’re in season (June/July). The main strip that runs through the centre of the city (Beursplein) is where all the clothes and shoes action is to be found. Rotterdam is known throughout The Netherlands for it’s abundance of shoe stores! 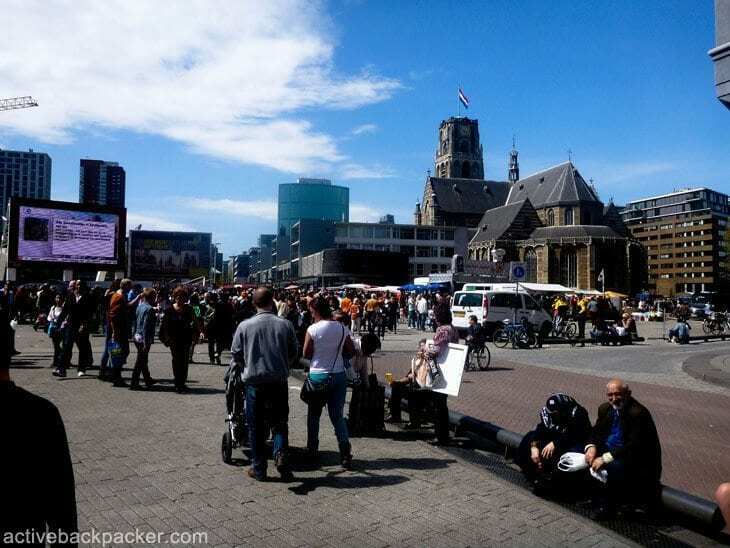 It’s fun to be in any of the major cities on Koninginnedag (Queen’s Day). Rotterdam (and Amsterdam too of course) is exploding with orange and merriment. Rotterdam has festivals throughout the year, and especially over the summer months. Wednesday Skate Night is a bit of fun and normally runs every Wednesday from the end of July into August for about 6 weeks. Museumnacht (Museum Night) – a night where all the museums open up and you can get in with one pass is a top mention! 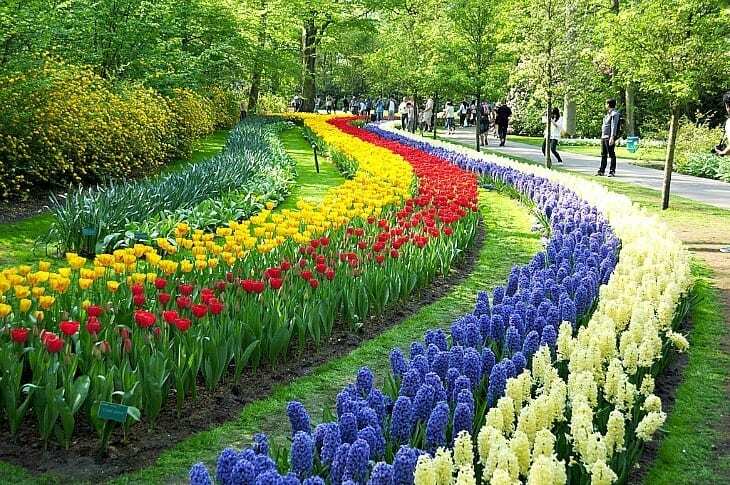 De Wereld van Witte de With (artist and cultural festival), and the Romantic Music Festival in Euromast park are other notable inclusions too. Public transport in Rotterdam is pretty good. You have tonnes of options between the train, metro, tram, bus and of course the trusty bicycle – you’re really spoiled for choice. If you plan on being in Holland for a while then consider getting an OVChipKaart (sort of like the Oyster card in London) and load it with some Euros. Of course. Most of Holland is WiFi friendly. Almost every cafe will have WiFi. Summer (although summer in Holland is always a gamble of course haha). 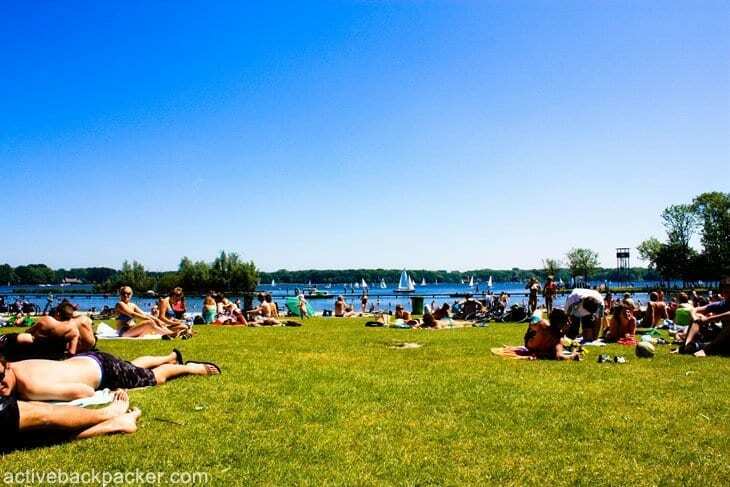 The Dutch love a warm summer’s day, so you’ll find them out in force if you happen to be there during a day of 25 degrees and sunny! It always makes for a nice atmosphere. Rotterdam does actually have its own airport, and flights using the airline Transavia can actually be quite reasonable. Of course there is also the train, most trains coming from Paris or London will stop in Rotterdam as well as Amsterdam. Don’t bother with buses between the main cities in Holland – as with a lot of Europe it’s all about the trains system! Rotterdam is not much a touristy city as it is, and a lot of the places that the locals go & see & do I’ve already mentioned above. Something fun to do might be to go see a Feyenoord football game in De Kuip (a stadium with a rich history and the homeground for the Dutch team Feyenoord) if you can get tickets. Try the breakfast at De Bazar on Witte de Withstraat is a scrumptious meal (especially if sporting a hangover). Because it’s such an underrated city and often people don’t give it a chance, both people from The Netherlands and tourists alike – and I’m happy I did and I’ve discovered what an awesome place it is. Rotterdam really is an excellent city once you get to know it. It’s always building and has a rich history and a can-do attitude teeming with art and culture, watch this city over the next 20 years – I predict a boom! BIO: Tom currently lives in Rotterdam (as you may have guessed). Like a lot of Aussies, he loves backpacking and seeing new places. He has a special spot in his heart for Europe and South-East Asia and his travel blog, Active Backpacker, reflects that. Follow along with his adventures on Facebook or Twitter on @activebackpackr. Do you have any tips on what to do in Rotterdam? Hey guys, thanks a lot for the opportunity to guest post 🙂 If anyone has any questions about Rotterdam, let me know! Great guide! Rotterdam is a fantastic city, there’s so much more to our little country than just Amsterdam 🙂 I wanted to add that Rotown is also a great place for a reasonably cheap meal. There are also a lot of cultural festivals during summer season (film festivals, music festivals, you name it!) that are definitely worth checking out! Cool article. That part about summer in the Netherlands being a gamble is definitely true. I’ve been living here for 8 years, so it was entertaining to recognize all your exerpiences lol. I’ll be off to Rotterdam for TBU Europe in May, so I am scouring the t’internet for blog posts! I am really looking forward to visiting – I like the idea that it’s an underrated city. Also, a friend of mine studied there for a year when she was at uni and raves about it as a fab place to go and visit. Great read! How about a new place to sleep 🙂 Check out our homely backpackers hostel Ani&Haakien just around the corner of Rotterdam Central station! Don’t forget to visit the Diergaarde Blijdorp Zoo as well, that is if you like animals of course:) I’ve also got a list on my site in case your interested: http://www.netherlands-tourism.com/tag/things-to-do-in-rotterdam/. Might be a useful resource to include. Thank you! My son lives in Rotterdam now, and I tell people what a great place it is, especially the markets! We have nothing like it here in Scotland, sadly. Looking forward to going again in late September , any tips on events on 25th/27th?